Back to the Planet Of The Apes: A new film for 2011? Science-fiction franchises rarely die. The eyes might close but the heart continues to beat, even if only a core collective of fans can hear it. The fact that Planet Of The Apes’ ticker is still pumping, despite the life-threatening surgery it underwent in 2001, is testament to the series’ resilience. Though a success in financial terms, Tim Burton’s film paled in comparison to its 1968 forefather, lacking its well-defined story, strong characters, thought-provoking subtext and, well, let’s be honest, plain old charm. Of course, fans of the original Apes movies – those that were disappointed in 2001, anyway – were always going to forget, if not quite forgive, Burton’s effort. But Hollywood? Had the critical chirping over the 2001 film – especially its confusing ending – halted the wagon train? Or would the realisation hit that the movie had simply strayed too far from the source? 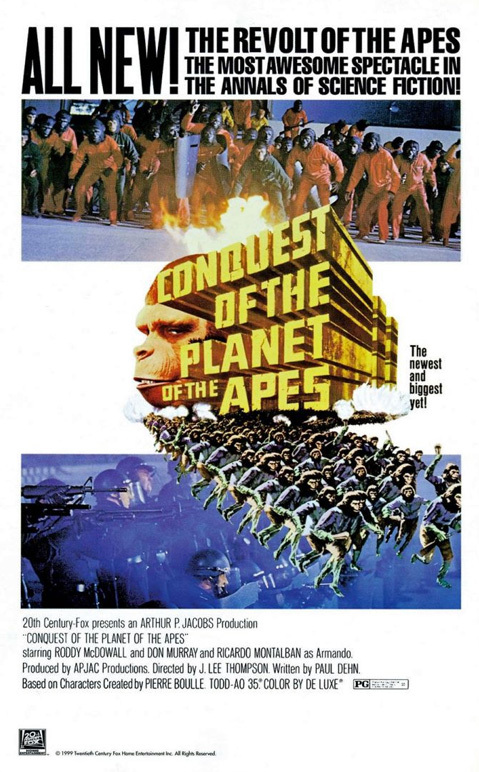 The answers, it seems, are in Caesar, the seventh Planet Of The Apes film, mooted for release by Fox in 2011 – providing it makes it into production (at the moment, it’s awaiting a green light). I’m not one to lie in bed all day, but I reckon risin’ and shinin’ at 6.30am on Saturday is pretty courageous. Yesterday’s heroic streak was inspired by a mini Planet Of The Apes fest-type convention thing at Memorabilia, the twice-yearly movie/TV/sport collectors’ fair held at the NEC in Birmingham. I had a 7.52am train to catch, to arrive at the venue around 11am. Say the word ‘fanzine’ to a lot of people and they probably think of a few sheets of A5 held together with attitude and, if you’re lucky, a couple of staples. Which is why I’m hesitant about describing Simian Scrolls as such. 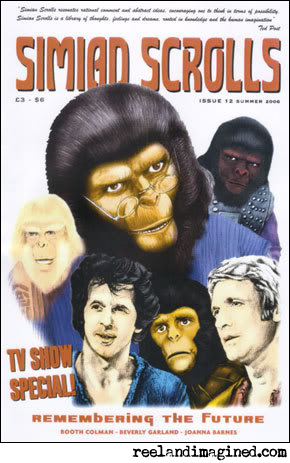 For the uninitiated, Scrolls is an expertly tended, 44-page, A4 publication, put together by Planet Of The Apes fans for Planet Of The Apes fans, that you really need to see if you’ve anything more than a passing interest in this classic series of movies and the short-lived TV show. It’s clearly a labour of love for its editors and contributors – its articles, interviews and reviews have real thought and care poured into them, and its enthusiasm and passion for its subject is infectious. I started reading around issue four, and have watched it grow over the years into a magazine that Apes fandom can be proud of. The final note of his vocal goes on forever. Babies are conceived, born and reach school age; governments rise and fall; continents drift. And… relax. Ginger lights a cigarette with what’s left of the match. “Aw, he’s too cool, isn’t he?” says a smiling Roger Tebbutt, the engineer for the SilverGinger sessions. I can see his point. The lights in the recording area are dimmed (for atmosphere, I presume). Ginger is standing alone in front of a microphone. He’s been there for about an hour now, “doing the bastards” as he puts it – recording high harmony vocal lines for a song called Doggin’, a bonus track for the Japanese version of the album and a possible single B-side. It’s not a task that he’s been particularly looking forward to, hence the decision to hold it back until the rest of the album’s vocals had been completed.